Gone are the days of lugging around something that makes you look like the cameraman for a local news station in the 1980s – on-the-go video recording is easier than ever, as an abundance of viral videos has made painfully apparent, but at the same time, there’s more to it than simply reaching for your smartphone. If you’re serious about committing those memories to film, we can help you find the best 4K camera for your needs. For the capability of a DSLR without the added weight, why not try a mirrorless camera on for size? Our best all-round buy is the Nikon D850, thanks to its high spec, high resolutions and even higher speeds, but if the thought of dropping over three thou on a camera is enough to set your knees trembling, there’s good news: now that we’ve become a bit more familiar with 4K video recording technology, there are options at all points on the price scale. For a much more pocket-friendly three figures, you can pick up the GoPro Hero6, or for more all-round performance, the Panasonic Lumix G80. For the dedicated documenter, we present the Nikon D850. It’s our best 4K camera for anyone looking to get a little more out of their shooting, whether that’s video or still, as it packs some of the most advanced (and exciting) image tech in-class. Shooting at 120fps in full HD, it’s amazingly quick to respond, and the fact that it uses the whole sensor allows for full advantage-taking of fancy lenses. As well as the technical nitty gritty, it’s also simply a handy ally, with microphone and headphone ports plus Power Aperture Control to make shooting a breeze. The A7S II has been on the market for a while now, but it’s still a great option for anyone looking to shoot high-quality still and video in 2018. The dynamic range is still hard to beat – read: huge – and testers found it to be better than many of its competing models at high sensitivities. Like our first choice from Nikon, it also uses its entire sensor for shooting, a feature conspicuously absent in some 4K video cameras, which means no undesirable cropping. Its quick autofocus and built-in image stabilisation are nice additions, too. It’ll cost you, but if there’s room in the budget for this fully-featured Canon DSLR, you’re sure to have no regrets. If you’re a keen photographer and videographer looking to grab some amazing still pictures of a range of subjects including landscapes and sports, as well as shooting impressive Full HD video, this remains one of the most well-rounded options out there. There are some fun options, like grabbing 8.8MP JPEGs from frames of your 4K videos using the Motion JPEG format, but things like the external mic, headphone, USB and HDMI Mini ports speak to its overall quality. All that onboard tech needn’t necessarily mean lugging around a camera the size of a small child. This Panasonic Lumix is our best compact 4K camera, offering the clever inner workings of a chunky DSLR in a pocketable form, and reviewers found that its meeting of ingenuity, features and simple operation made it a dream to use. One commonly commended feature was the My Memory function, which keeps your favourite video settings under a single heading for quick reference, ideal for off-the-cuff shooting while out and about. According to expert reviewers, the Sony Alpha A6500 comes with pretty much everything you could want as a videographer. It oversamples video data and then squeezes it down to a richly detailed 4K output, and you can bump it down further to 120p if you want to capture slow-motion video. The touchscreen allows for easy changing of the focus point, much like you would on your phone’s camera app, a really handy function for shooting video on the go, and there’s a comprehensive menu system for changing all the variables your heart could desire. The only downside? There’s no headphone jack, so keep an eye on those on-screen levels. 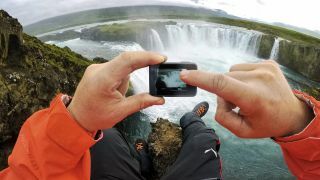 The GoPro has earned a name for itself as the first choice of adventurers everywhere, and with pretty good reason, it seems. Our budget option, it doesn’t compromise on impressive video quality, usability, or build to come in at the affordable price of just under £400 RRP. Reviewers raved about it for its simple and comfortable controls and its large screen, and even first-time users said they found it easy to get started. The big seller though was its travel-friendliness, with a compact but rugged body, and waterproofing to 10m. The G80 (look for the G85 if you’re shopping from the United States) boasts a Dual IS Mark II system that works in both the body and lens to stabilise images, so if you’ve been left disappointed in the past by shaky footage or blurry photographs, you might be tempted to give this one a whirl. And we wouldn’t blame you – in addition to being our second-cheapest 4K camera, it packs in some deceptively high-end features, like Live Cropping for profesh-looking panning, and no optical low-pass filter, resulting in detailed footage.